"The economy is growing. Record numbers are in work. Unemployment is falling. And the surveys of confidence and future activity are stronger. Let me say tonight: the British economy is healing." The Chancellor's annual address to City grandees at yesterday's Mansion House speech produced striking headlines in this morning's papers, with several choosing to lead with George Osborne's claim that the economy is "healing". But does his evidence back up his conclusion? The first "green shoot" that the Chancellor sees as an encouraging sign of recovery is that the GDP figures that measure economic growth are positive. The ONS confirmed last month that economic output grew by 0.3% in the first quarter of 2013. While Mr Osborne is correct that the latest data suggests that there has been growth in the latest quarter, whether or not this means this is a sign of the economy "healing" is more contentious. As we can see from the graph below, while we have previously seen strong growth in the quarterly figures in recent years, the economy has more often than not contracted in subsequent quarters. Even stronger periods of growth were recorded in Q3 2011 (0.6%) and Q3 2012 (1%), but both were followed by periods where the economy shrunk. Similarly, the most recent period of growth pointed to by the Chancellor follows a quarter of contraction of the same size. So while the most recent GDP data does suggest a small improvement, and every recovery has to begin some time, it might still be premature to claim that the economy is healing on the strength of it. 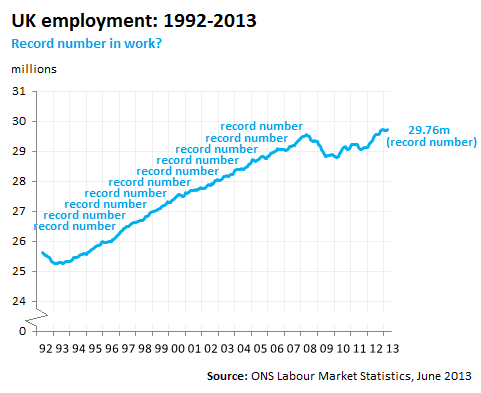 So what about the second reason for the Chancellor's optimism: an improving employment outlook? As we saw last week, Mr Osborne's first claim - that there are "record numbers in work" - is true, although it doesn't necessarily tell us that much about the relative health of the jobs market because the population is growing. This means that we've seen a new record set for the number of people in employment in every year between 1995 and 2007, with the only interruption to this trend coming during the two periods of recession that book-end this period. For this reason, it is more useful to look at the (un)employment rate (i.e. the proportion of all people active in the labour market who are (aren't) in work). Fortunately for all of us, the unemployment rate has indeed fallen in recent months, falling from a peak of 8.4% of all economically active people out of work in late 2011 to 7.8% in the most recent period — not a record, but improving. The third foundation of the Chancellor's claim that the economy is healing is that there are signs of increased confidence and future activity in the market. Surveys of business or consumer opinion about the likely direction of the economy are tracked by the House of Commons Library in the Business and Consumer Confidence section of its regular Economic Indicators release. Across all indices that it tracks, confidence in the economy has increased. The European Commission's Economic Sentiment Indicator shows that confidence in all business sectors was 6.7 points higher in May 2013 than it was a year ago. GfK NOP's Consumer Confidence Barometer shows that, over the course of the year to May, there has been a seven percentage point increase in the number of people expecting the economy to improve in the near future. That said, there are still more consumers expecting the deterioration in the economic environment than there are expecting an improvement, with a net confidence score of -22. Meanwhile the CBI keeps track of the future output expectations among manufacturers, and has found that there has been a sharp increase in the number expecting production to increase over the past 12 months. In May 2012, 3% more people expected output to fall than expected it to rise, whereas in May 2013, 18% more businesses were predicting an increase in production, a net gain of 21 percentage points. All three of the metrics presented by the Chancellor as evidence of an economic recovery on course show some positive signs, although some are stronger than others. While GDP did grow in the most recent quarter, it might be premature to draw too many conclusions on the strength of this single data point: recent history has shown that a single quarter's growth is not always a spur to sustained improvement. While the Chancellor's claims about "record" numbers in employment rings a little hollow when we consider the demographic changes underpinning it, recent drops in the unemployment rate show improvements in the labour market. Similarly, while consumer confidence still remains broadly negative on GfK NOP's measure, all three of the commonly-used confidence indices have shown marked improvements over the past 12 months. Does the Olympics account for a quarter of economic growth since the election? Are the elderly driving our economic recovery? Spending Review 2013: What's the Government's record on infrastructure? Is the Government rebalancing the economy?